PORT-AU-PRINCE, Feb 24 2013 (IPS) - Outraged that they have not been consulted, this week Haitian senators called for a moratorium on all activities connected with recently granted gold and copper mining permits. In a resolution approved by 15 of 16 senators present, the lawmakers also demanded the establishment of a commission to review all of the current mining contracts and “a national debate on the country’s mineral resources”. For a country with a weak state, the royalty is the safest place to get your money. Anything under five percent is just really ludicrous. 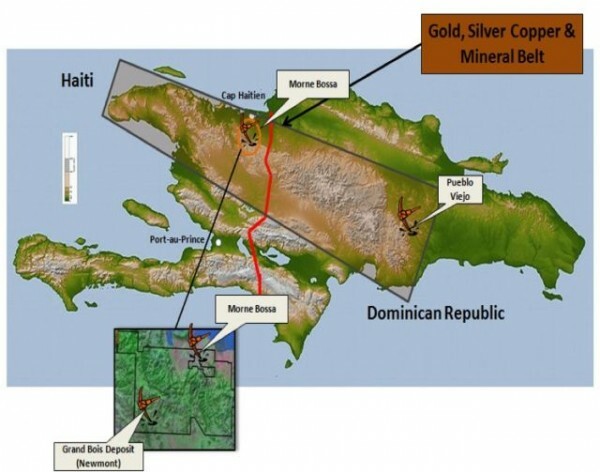 Haiti’s “Gold Rush” Promises El Dorado – But for Whom? Cadouche, HAITI, 21 February 2013 – The population of Cadouche, a small village about 12 kilometres south of Cap-Haitian in Haiti’s North department, is nervous about three new mining exploitation permits granted last December in an opaque and secretive process. Located near the Morne Bossa deposit, the Cadouche economy is based mostly on agriculture. Families work day and night to take care of their needs. And they ask themselves if they are invisible to the authorities in Haiti’s capital. Recently, over a hundred people living in Cardouche met to learn more about the mining industry. One after another, they asked questions and expressed their frustrations. Steno Chute, a member of the Democratic Movement for the Development of Quartier-Morin (Federation du movement démocratique pour le développement de Quartier-Morin - Femodeq) who grows corn, beans and sorghum, said he is afraid of mining. “The [Jean-Bertrand] Aristide, Préval and [Michel] Martelly governments are opening up the country to pillagers in the name of the untouchable neoliberal plan, without thinking of the devastating consequences,” noted farmer Francisco Almonord, bitterly. Thieves, bet thieving corporate backed US and it’s dirty mining earth rapers are involved in this. Truly evil.